Euler's number, e, is an irrational number. ex is a very important function in mathematics and is called the natural exponential function. The index laws apply to e as with any other base. 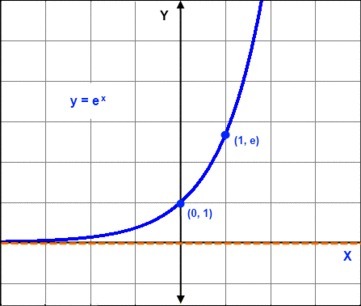 The graph of $y = e^x$ has the same shape as all other exponential graphs. The most interesting thing about the graph of $y = e^x$, is that for every point (x, y), the gradient is the same as the y-coordinate. The graph of $y = e^x$ is the only exponential graph for which this is true.